The SGF experience has been emblazoned in the hearts and souls of generations of Jewish boys and young men fortunate enough to have experienced the magic. Sadly, the facility we once knew as SGF Vacation Camp may cease to exist as we knew it. But, through the efforts of dedicated people, the gift that SGF given to us may be given to another generation of boys. 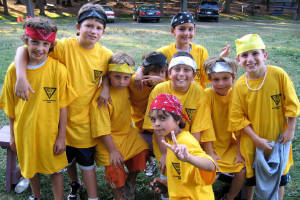 Underwriting the cost of a boy's experience at any camp that is operated akin to the SGF vision. Resurrecting SGF Vacation Camp at alternate locations for short camp stays. Reestablishing a permanent site for SGF Vacation Camp to operate on a regular schedule every summer. This mission, although ambitious, could be achieved with the SGF spirit! How can you help bring the vision to life? Invest in our future! Pledge to make it better. Ask your employer to match your contribution. Send a letter or e-mail to your friends, family and colleagues ASKING for support. Collect used cell phones to be converted into cash. Include SGF in your estate. Commit it to your Last Will and Testament. Make The SGF Foundation one of your beneficiaries. Include SGF in your life insurance portfolio. Name The SGF Foundation as a beneficiary. Distribute ”Change the World One Kid at a time” coin cans to your friends, family, colleagues and local merchants. Thank you so much for your interest and helping to rekindle the spirit of SGF. Any size donation will help. 100% of your contribution will be applied to funding boys' summer camp experiences. The Foundation does not use Foundation funds to support itself. We are self funding. Feel free to donate five dollars or five thousand dollars. Hey - if you're really feeling generous, $50,000 would go along way - and we'll send you a mug!